Man of Steel 2 to Include Bizarro, Supergirl & Brainiac? Last month, an unconfirmed report claimed that Warner Bros. has put their sequel Man of Steel 2 on "indefinite hold," following a rumor that the studio was seeking Mad Max: Fury Road filmmaker George Miller to direct. Yesterday, a report surfaced that revealed Man of Steel 2 isn't being delayed, and that George Miller still isn't sure what project he wants to take on, but Man of Steel 2 is his if he wants to take the reins. Today we have another report from Heroic Hollywood, which claims this superhero sequel will feature villains such as Bizarro and Brainiac, along with Kara Zor-El herself, Supergirl. There will be potential SPOILERS below, so read on at your own risk. In 2013's Man of Steel, General Zod has been searching for a codex that contains the DNA for the entire Kryptonian race. This codex was hidden inside Jor-El/Superman (Henry Cavill), and this is what Brainiac is seeking as well. The twist is, he supposedly isn't trying to obtain the codex from Superman, but rather Supergirl, who will reportedly be introduced into the DC Extended Universe (DCEU) in Man of Steel 2. As for Brainiac's involvement, Batman v Superman: Dawn of Justice director Zack Snyder did recently tease that Brainiac will be used "down the road" in a future DCEU film, which, if this rumor is true, is Man of Steel 2. This rumor also contends that Brainiac will take the "bits of Kryptonian knowledge" he has and use it to create Bizarro, who Brainiac will send after Kara to get the codex. Supergirl was actually revealed in a Man of Steel comic book prequel, written by David S. Goyer, which showed Kara as she neared the end of her training. She was set to become a member of the Krypton's 'Explorers Guild', which was tasked with finding planets that Kryptonians could live on. Of course, even if this rumor is true, this version of Supergirl will have no connection to the Supergirl TV series, which debuts next month on CBS. The universe created in the DCEU is completely separate from the universe shown in a slew of DC Comics TV shows, such as Fox's Gotham and The CW's Arrow and The Flash. Still, it will be the first time Supergirl was shown on the big screen since the 1984 Supergirl movie, which starred Helen Slater. Zack Snyder and David S. Goyer reportedly always wanted to introduce Supergirl in the sequel, which will focus just as much on her as it will on Superman. This aspect of the story is supposedly what piqued George Miller's interest in the first place. This rumored story line is what Zack Snyder and David S. Goyer reportedly pitched to Warner Bros., but we don't have any confirmation on that. 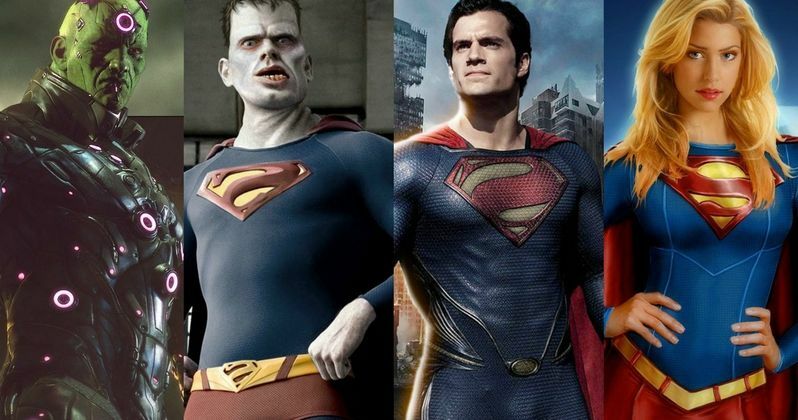 Would you like to see Bizarro, Brainiac and Supergirl in the same movie? Let us know what you think, and chime in with your thoughts. Michael B. Jordan Wanted as the DCEU's New Superman?